My first celebrity crush was a hard and long kept secret into my 21st year of life on this planet; but now that being a nerd is cool I don’t have to admit it in a hushed whisper. I’m glad to admit loudly and proudly that Wesly Crusher was my first in-my-imagination bf (before I was developed enough to grasp that it was an actor playing him….) and now as an adult Wil Wheaton is the kind of nerd I want to be like. 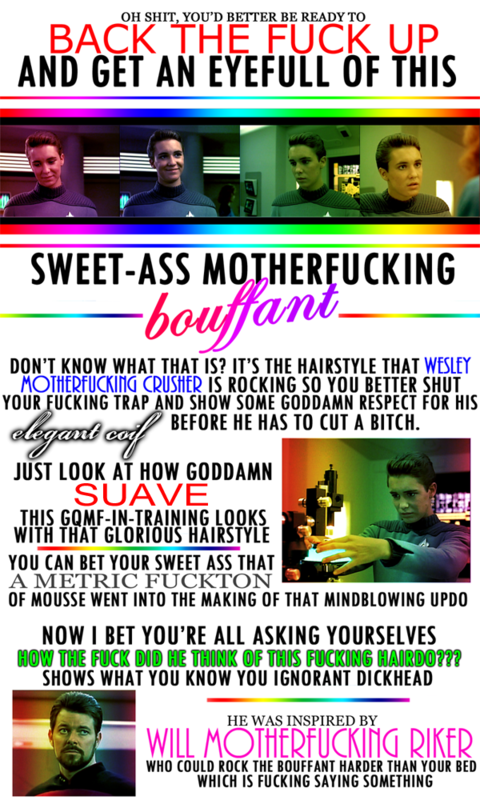 That’s why this made me laugh with glee; and also realize that if TNG came out today I’d probably be dreaming about Riker on the holodeck instead of Wesley in the lab in engineering. Wheaton posted it up, originally crafted by a friend of a friend. Awesomes. ’nuff said. Check out Wheaton’s blog; he’s got some more funnies if that’s what you’re into.